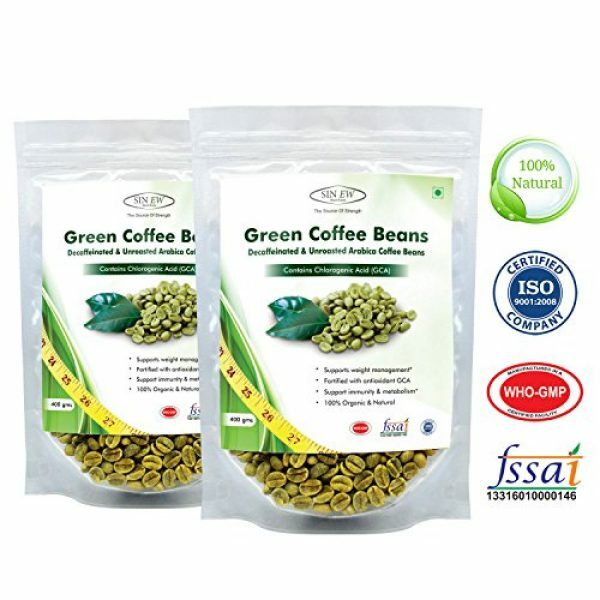 100% veg, pure and safe organic green coffee beans, fortified with antioxidant (GCA) a natural appetite suppressant| Also available in powdered form, Search for B01N97DQ23 | B01NBRUFA5 | B01MSOV42B | B01N4V75KY in the search bar. 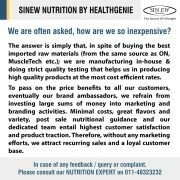 SINEW ORGANIC GREEN COFFEE BEANS (Arabica Beans) Sinew organic coffee is un-roasted beans come from organic cultivated farms, prepared for use under a natural treatment in a very special way to preserve the vital ingredients and it is commercially obtained for consumption from Arabica beans the most well known species of coffee. Arabica coffee is considered to be superior in quality. 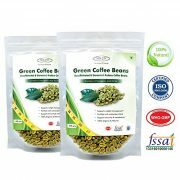 Green coffee beans are used to prepare the green coffee drink to support weight management, suitable for both the genders and vegans too. 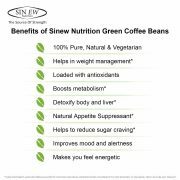 Sinew green coffee beans are rich in a well known antioxidant chlorogenic acid, which has a positive effect on health and well-being. 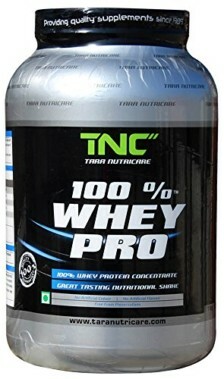 The taste of a pure green coffee drink is almost similar to the mixture of green or black tea. 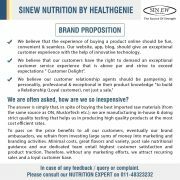 Sinew works with no additives, thus it is guaranteed 100% natural, organic and unprocessed arabica green coffee beans. 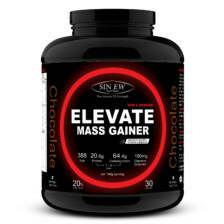 Sinew Green Coffee Beans works by blocking the absorption of fat so that your body is forced to utilize what it has already stored for energy and the main active ingredient is chlorogenic acid in coffee beans, which reduces the absorption of simple carbohydrates from the digestive tract. 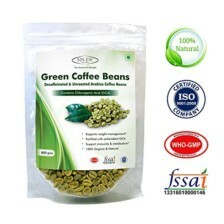 Soak 25gm of green coffee beans overnight. Strain the content and dry the beans with a clean and fine cloth towel. Now crush the beans to granules. Take a pan and add 300ml of water in granulated beans, and boil the mix over low heat for about 15 mins. Remove it from heat and let it cool, filter the content to remove the granulated beans. Now green coffee beans drink is ready to consume. 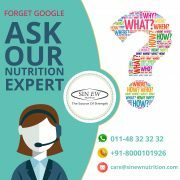 Recommendations: Take one cup of Sinew green coffee bean drink after each meal. 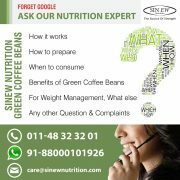 Consult your medical practitioner if you have any tolerance issue or allergic to coffee, before consuming the green coffee bean drink. This one’s really effective and much cheaper than the Arabica green coffee beans available in the market. 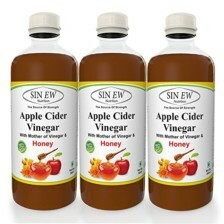 This is a genuine product and gives good feeling on consumption and even improves digestion. Just one teaspoon of the beans everyday is sufficient.